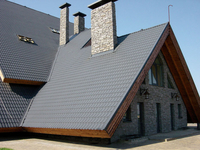 Established in 2000 Roof and Facade factory “Estel” is now one of the largest manufacturers of roofing and wall materials, back-ventilated facades and light-transparent protecting constructions made from aluminum profiles of the leading Russian and European companies. In any direction of its activity, Estel is always keen on individuality, providing our clients only with top-notch technologies and materials. At present Estel has a good production space of 6000 sq.m. with the ultramodern equipment, and this lets us have a wide range of building materials to any taste.